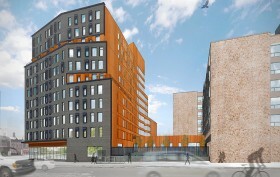 The West Side Federation for Senior and Supportive Housing is moving ahead with plans to expand their recently finished Borinquen Court senior housing complex at 285 East 138th Street in Mott Haven. Two new mixed-use buildings will be constructed on either side of the existing 145-unit building, and once complete the entire complex will be home to more than 300 affordable apartments and will be known as Tres Puentes (Three Bridges) due to its views of the Willis Avenue, Madison Avenue, and Third Avenue bridges. All housing will be reserved for the elderly or physically disabled.